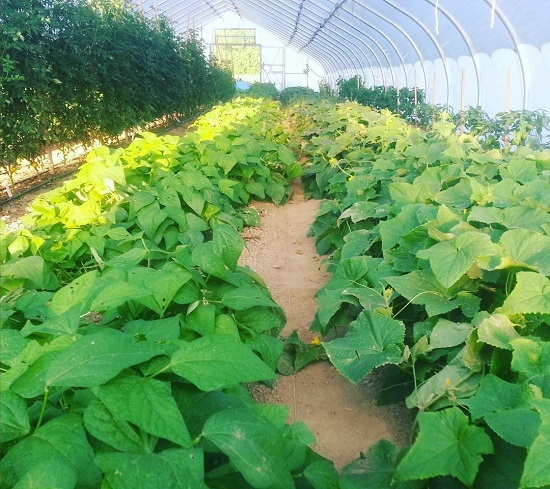 Tall tomatoes with beans and cucumbers in our hoophouse. Our hoophouse tomatoes are doing well this year. Apart from the determinate Glacier, they’ve reached the top of the stakes and as high as we can string-weave or pick. We transplanted them March 15, a month before our last frost date. 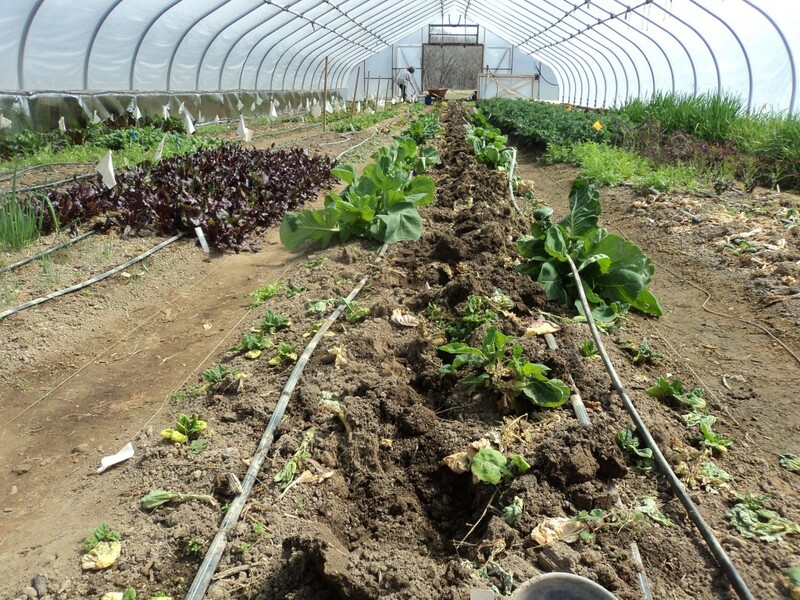 We harvest each of our hoophouse beds every two days,alternating them to smooth supplies.We plan to harvest for ten weeks from May 25 till July 31, by which time our first outdoor planting is yielding well. In the South many of us grow only our early tomatoes in hoophouses, as outdoor crops produce abundantly once the weather warms. We harvest our outdoor tomatoes (sown 3/15) from July until frost, initially overlapping with our hoophouse earlies, then on their own. 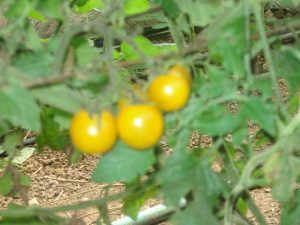 Ken Dawson in Cedar Grove, NC, has a succession planting plan for outdoor tomatoes. He makes four field plantings at three week intervals. 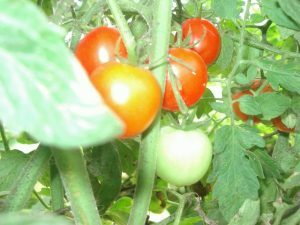 In cooler climates, because yields will be higher, it is more common to grow tomatoes in hoophouses whenever possible, and keep them growing for the whole season. 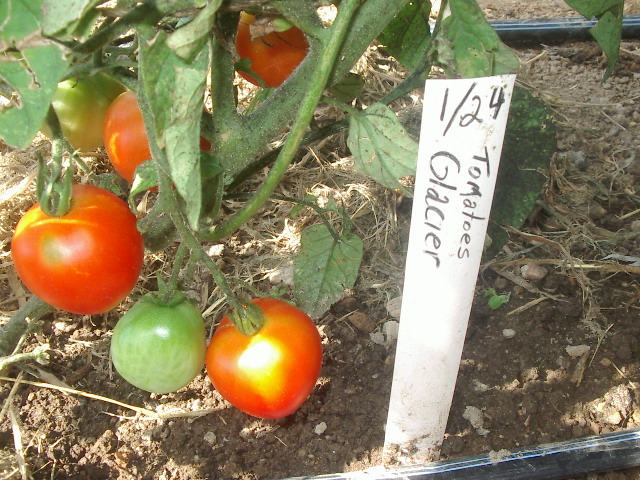 Glacier tomatoes in our hoophouse in late June. 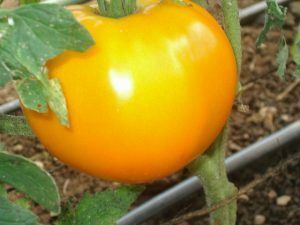 It is possible to grow successions of determinate tomatoes in a hoophouse, but any advantages are usually outweighed by the disadvantages of disease spread and the extra time plants spend before they reach production. In the past we grew a late hoophouse crop, to take us beyond the first frosts. We sowed June 18 and transplanted at a relatively young age (tomatoes grow quickly by that point of the year). We gave this up in favor of growing more leafy greens. Each year I take notes on the varieties we have in the hoophouse, and often we run a taste test. 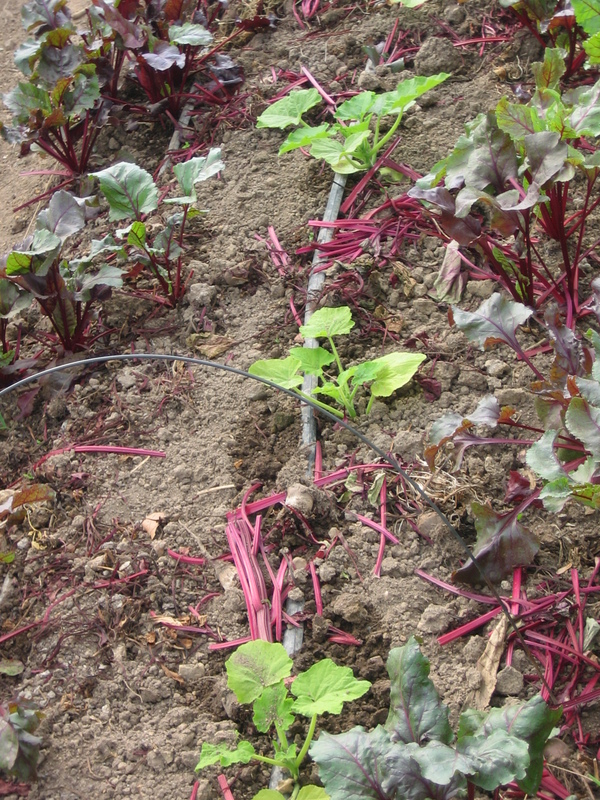 I have also been gathering information from other growers, on which varieties do well for them. Before I get into talking about specific varieties, I want to say a bit about types of tomatoes. 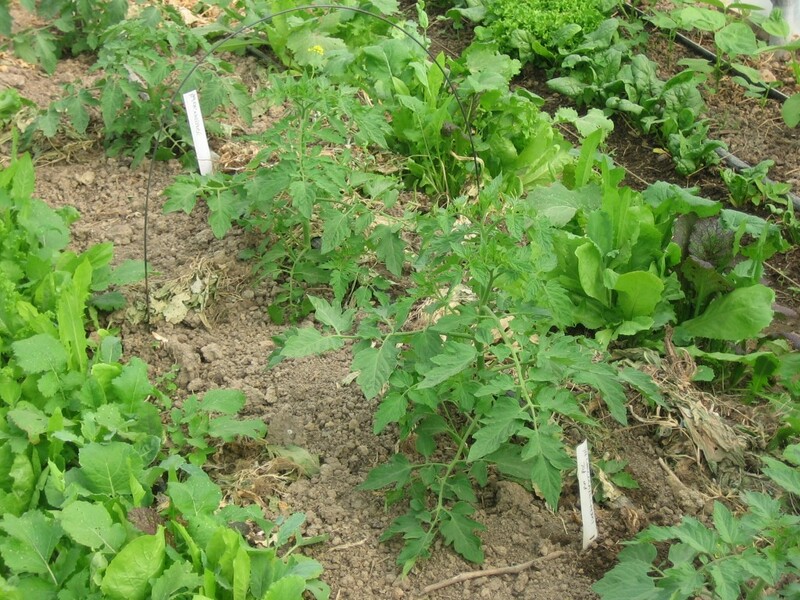 Varieties can be divided into two main growth types and then the exceptions. Determinates (bush tomatoes) are compact varieties that stop growing at a height of 2′-4′ (0.6-1.2 m). The number of stems, leaves and flowers is part of the genetic makeup of that variety. The number of leaves between one fruit cluster and the next decreases by one each time a cluster is produced, until the terminal cluster forms. No more leaves or flowers develop after that. The fruit ripens and the plant starts to die back. Harvest can be 1-3 months from start to finish. Because they are faster to mature than indeterminates, they are often chosen for early crops. Determinate varieties usually bear lightly the first third of the harvest period, heavily the second, then lightly for the last third, so it is not very productive to plant crops so late that they don’t reach their second (main) month of production before frosts. Determinates need no pruning as the yield of fruit is inherently limited. 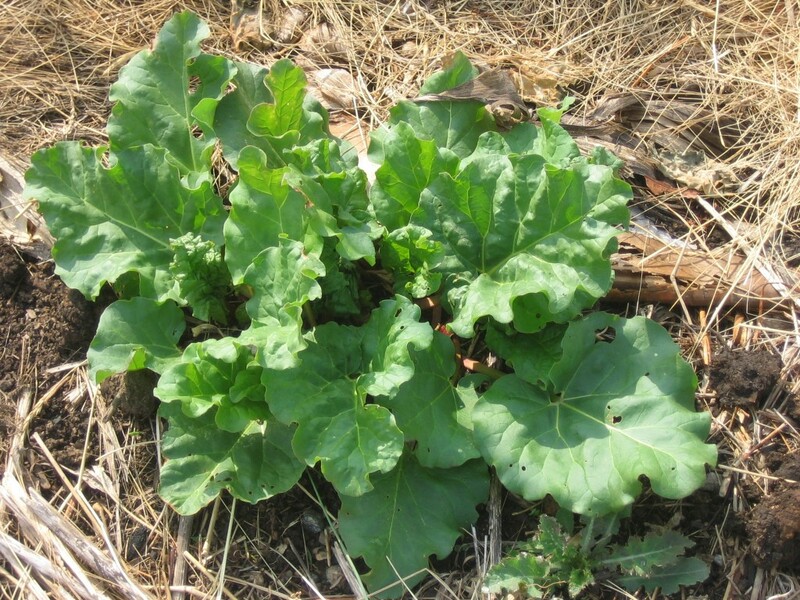 Most need little staking, but some determinates are quite tall, and produce for quite a long season. Tomato Mountain Magic in our hoophouse. Sun Gold cherry tomato in our hoophouse. Star Grape (62d red). We found out the hard way that growing too many cherries is not wise – they take a long time to harvest and when you compare yields it’s clear they don’t add up to much. We grow two plants each of Sun Gold and Five Star Grape, 6 each of Garden Peach and Mountain Magic, 13 Stupice and 16 Glacier. Very biased towards the earliest. Jubilee tomato in our hoophouse. Indeterminate varieties can continue to grow and produce more fruit as long as the weather is warm enough, and as long as they don’t get struck down by frost or disease. The number of leaf nodes between one cluster and the next remains the same all the way up the vine. Indeterminate tomatoes need substantial support. Pruning is not essential – whether or not to prune depends on your climate, the varieties you are growing and how long you plan to keep the plants for. Amys Apricot cherry tomato in our hoophouse. Semi-determinate tomato varieties are larger than determinate but smaller than indeterminate plants. Some seed suppliers just call them large determinates. These plants usually require staking. 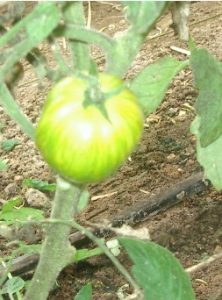 If you are growing in a cold climate you will probably want to grow indeterminates in your hoophouse and keep them all season, as it takes a long time to grow a tomato plant. 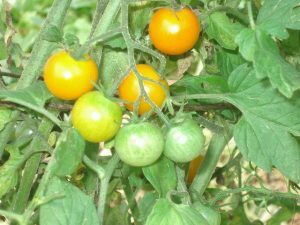 If you are growing in hot climates, you will probably only grow your earlies in your hoophouse and then grow a succession of outdoor tomato crops. If you grow where there are lots of tomato diseases, you will do better with succession planting than having all your eggs in one tomato basket. If your season is long enough for multiple plantings, you might choose to start with fast determinates to catch the early market.